You might have asked: why do we need more than one electrode? Can't we simply take a measurement with one electrode and get a reading to hear and see spikes? In this experiment, we will help to explain why you need a reference electrode. You will learn what volts are, and what people mean when they ask: "What's the voltage?" You will also learn what a reference electrode is and why we need one to measure neural activity when using the SpikerBox. In order to understand this experiment, one must first have an understanding of volts (or voltage). Voltage is a measure of the electrical difference between two points. 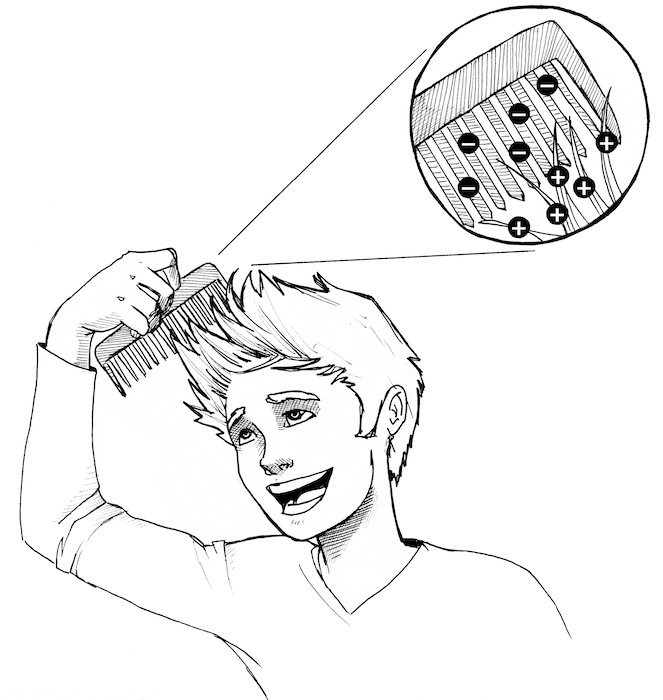 For example, you have ever combed your hair on a dry day and noticed your hair begin to "float" towards your comb? This is because you have caused an electrical difference between your comb and your hair. When you comb your hair, the plastic comb "strips" electrons from your hair, making a difference in charge, or "voltage," between your hair and the comb. As a result, the separation in charge curiously makes your hair attracted to the comb, while also making individual hair strands repel each other. Because voltage is a measure of the difference between two points, your SpikeBox electrode cable has two needles instead of one; we are measuring the voltage between the two electrode pins. In an ideal world, your two electrodes have distinct identities, a "recording" electrode that captures the signal of interest (spikes) and is hopefully near nerves, and a "ground" electrode that ideally is in a part of the organism that has little electrical signal present. Why? 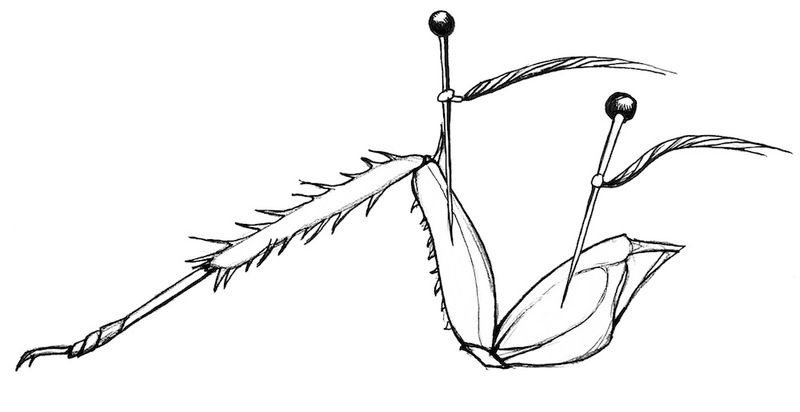 Because you need a difference between the two electrodes to see your spikes. Spikes (action potentials) are exceedingly small, on the order of microvolts to millivolts, and must thus be amplified by devices like your Spikerbox in order to be detected. Let's consider what happens when a spike travels down a nerve, and we have our recording and ground electrodes on opposite ends of the nerve. 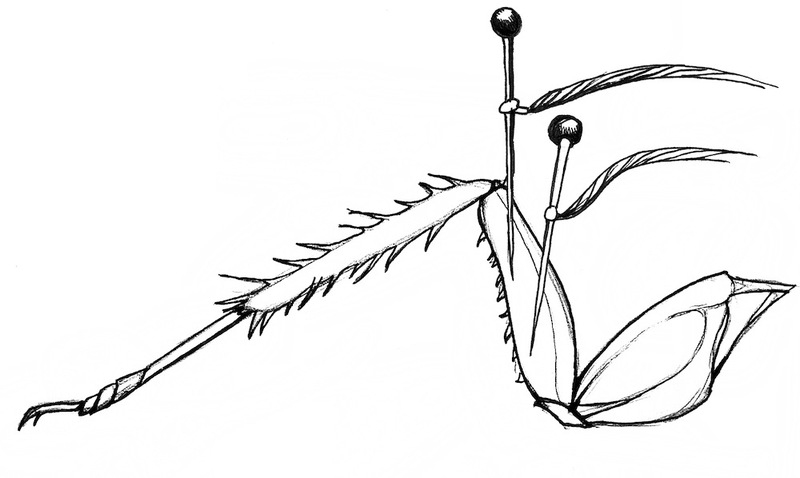 In the figure below, the spike is represented as a '+' on a surface of all '-' within the nerve. As the recording electrode encounters the spike, the result is an upward slash on our voltage-measuring scope. Then, when the spike is in between both the recording electrode and the ground electrode, there is no difference between what each electrode "sees", and we measure a zero. As the spike then travels past the ground electrode, the recording electrode now seems negative with respect to ground, and there is a downward slash on the scope. Then, when the spike travels further down the nerve away from the ground electrode, the voltage reading returns to normal. Now consider a thought experiment where we encounter a strange, alternative world where action potentials travel infinitely fast down a nerve. Imagine we try to record spikes from this nerve with the same electrode configuration as above. If an action potential happens, and we are measuring the voltage difference between the recording electrode and ground electrode, what do we expect to see? Since both the recording electrode and the ground will be at the same electrical potential due to the infinitely fast action potential, we would measure a zero value...which would leave us to hypothesize that this animal does not have action potentials, and thus uses some new, unknown to science, method of neural communication! This would be great for our careers if we were correct, but unfortunately our conclusions would not be true. Our electrode placement simply did not allow us to "see" the action potential. In the top condition (electrodes far away, but both in neural tissue), you are recording a "very crowded" mix of spikes from six neurons (as you would see the three neurons near the ground electrode and the three neurons near the recording electrode). In the middle condition (ground electrode in bone, recording electrode in neural tissue), your recording would be less "crowded", as the ground electrode is in bone where no neurons are present. 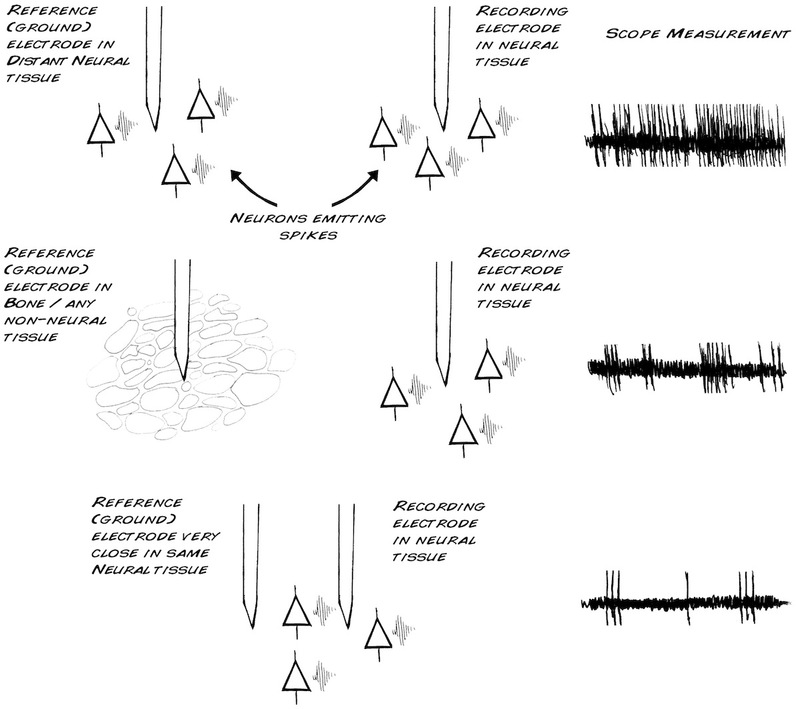 You would only see spikes from the three neurons near the recording electrode. Now consider the bottom condition. Notice there are two neurons exactly in between the recording and the ground electrode. Both electrodes would see the exact same signal from these two neurons; therefore you would not be able to observe the middle neurons. You would, however, be able to record from the neuron on the right side that is closer to the recording electrode. In this recording, you would get a very clean view from only 1 neuron, something we neuroscientists love. And why? We shall return to that later. 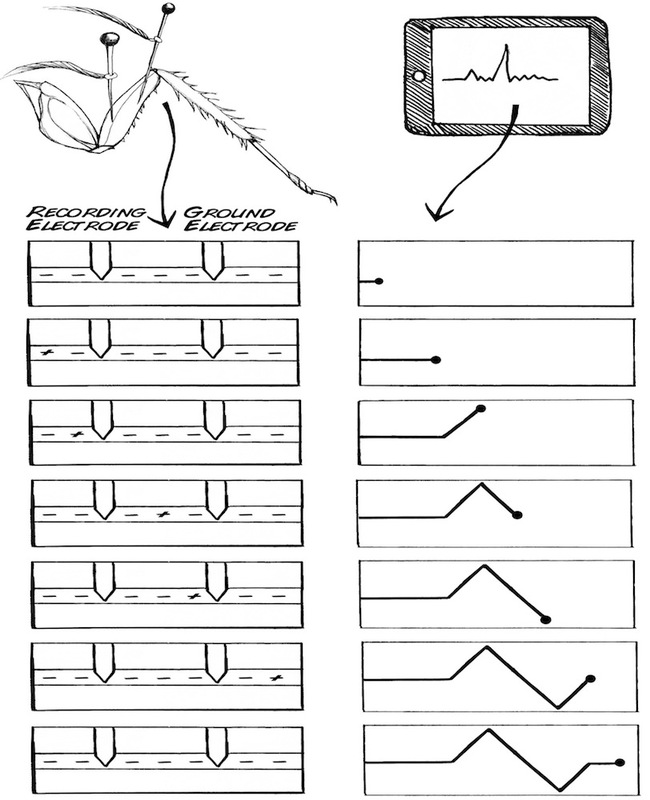 But for now, in this experiment, we will examine various configurations of recording electrodes and ground electrodes. Set up your computer/mobile device for recording and prepare a cockroach leg as previously learned. 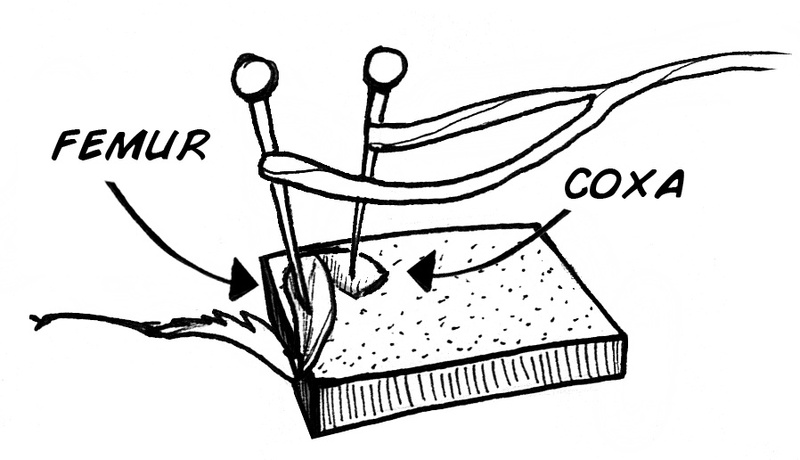 Put your recording electrode in the femur, and your ground (reference) electrode in the coxa as shown below. Blow on the leg of your cockroach. Make note of whether the response is a broad "whoosh" of neural activity, or whether it is an individual spike train. Now move your ground electrode into the femur along with the recording electrode, as shown below. Repeat steps 3-4 as above. Finally, move both your ground and recording electrode into the coxa, as shown below. What do you notice? Can you provide an explanation for the difference? Here is a classic cockroach leg neuroanatomy paper from 1954 that can help. What is voltage? When voltage is reported, is it an absolute number or is it a differential value? In this experiment, you learned about what happens when you move your ground and recording electrodes to a new location. What do you think would happen if you simply reversed your 'ground' and 'recording' electrodes in the first configuration, moving the 'ground' to the femur and the 'recording electrode' to the coxa? With one electrode in both the coxa and the femur, there is generally a lot of "background activity." How does that change when you put both electrodes into the femur? vs. both electrodes in the coxa?